Welcome to Mommy & Me Mondays! Each Monday Amanda and I will feature a quick activity you can do with your little ones at home to encourage them to learn, grow and experience the world around them. So check back each Monday for a new project. We love re-purposing things around our house, not only does it save money but it also teaches our little ones to make the most out of the things that we have. To welcome in Earth Day we are making an Up-cycled Herb Garden. It is perfect for a kitchen window. To get started collect the following materials. ** ahead of time punch a few holes in the bottom of your cans to allow for proper drainage. To make your up-cycled herb garden start with a few clean empty tin cans. Take white construction paper and wrap the cans using tape to attach to the can. Find some of that tissue paper you have been saving around the house from all of those birthday bags, and let your little one practice their cutting skills by cutting it into small squares. Once your squares are cut have your little one sort them into color piles. Have them apply them to the can using a foam brush and some modge podge. The more they overlap the better, let them get as creative as they want blending colors and overlapping squares. Allow to dry for a few minutes before filling them with your favorite herbs. What better way to show your children how foods are grown than this kitchen herb garden from dirt to dinner! Incorporating fresh basil from the garden into family pizza night just once will provide you with savings that you will continue to see all summer long...happy planting! Science Connection: As you get ready to plant your herbs talk with your little ones about plants. You can talk about how plants are living things and they need certain things to grow ( air, water, sun and soil). You can even discuss the differences between non-living and living things. A backyard scavenger hunt is the perfect way to begin. You can also have your little one identify the parts of their plants, the root system, the stem, the leaves and in some cases the flowers. Having your little one take care of their mini herb garden over the next several months will help to teach them responsibility as well as reinforce what living things need to grow. 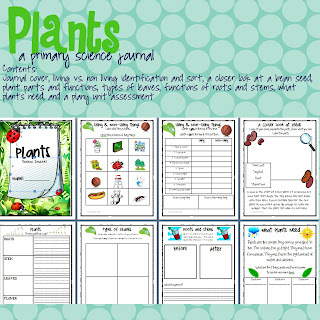 store for a science activity journal on plants.